Throughout its operations, Broadlawn Manor Nursing & Rehabilitation Center has embraced technology as a means of enhancing resident safety and independence, and staff productivity. The facility had been a satisfied user of STANLEY Healthcare’s WatchMate wander management system for many years, but in 2010, Vice President of Senior Services Gerard Kaiser and his team embarked on a review of Broadlawn Manor’s wander management needs and took the decision to migrate to a new generation of technology with greater functionality. 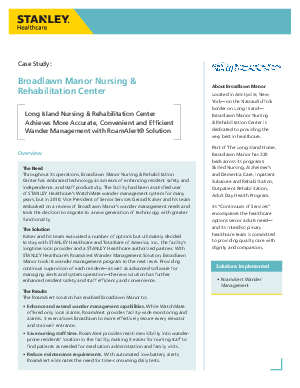 Read this case study to learn how Long Island Nursing & Rehabilitation Center achieves more accurate, convenient and efficient wander management with RoamAlert® Solution.